Despite struggling in the ratings for their first two airings, Fox has picked up six additional episodes of Ben and Kate and nine additional episodes of The Mindy Project, bringing both new Tuesday night comedies to full-season orders or close to it, after just two airings. Ben and Kate will get 19 total episodes, while The Mindy Project gets the full 22 episodes. Ben and Kate posted only 3.22 million and a 1.6 18-49 rating for its second episode last Tuesday, down more than 30% from its 2.1 18-49 rating premiere, which wasn't that great. Meanwhile, The Mindy Project posted just 3.68 million and a 1.9 18-49 for its second episode last Tuesday and that was down more than 25% from its 2.4 18-49 rating premiere, which was disappointing. While this is surprising indeed, it is good to see networks give comedies a chance. NBC gave Go On and The New Normal full season pick-ups last week, and they haven't been that great in the ratings either, especially The New Normal. As for other new sitcoms, things look very bleak for NBC's Animal Practice, while Guys with Kids could go either way depending on how it does in the next few weeks (and if it continues to build solidly out of its lead-in). ABC's The Neighbors has aired twice so far and ABC is mulling ordering three more scripts, so that could be a good sign for more episodes...depending on how it does the next few weeks. New sitcom Malibu Country starring Reba McEntire will premiere on ABC in a few weeks. CBS has struggled with Partners on Monday nights, but in reality it is doing better than what Fox just picked-up, though CBS has a higher standard, especially on a better performing comedy block. I still don't think Partners will get more episodes ordered. The Mindy Project is a new single-camera comedy from Emmy Award-nominated writer/producer and New York Times best-selling author Mindy Kaling (The Office) that follows a woman who, despite having a successful career, desperately needs to break bad habits in her personal life. A new episode airs tonight at 9:30/8:30c on Fox. Ben and Kate is a new single-camera young ensemble comedy that follows odd-couple siblings as they push each other out of their comfort zones and into real life. A new episode airs tonight at 8:30/7:30c on Fox. 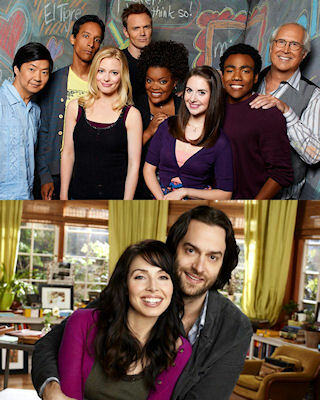 Given the success we've had for the past four weeks – including winning the first week of the season in A18-49 – we've decided to continue to concentrate our promotional strength on our new NBC shows that are scheduled Monday through Wednesday and have therefore decided to hold Community and Whitney from their previously announced premieres of October 19. Without having to launch these comedies on Friday at this time, we can keep our promotion focused on earlier in the week -- plus we will have both comedies in our back pocket if we need to make any schedule changes on those nights. When we have a better idea of viewing patterns in the next few weeks, we will announce new season premieres of Whitney and Community.